The Evolution of Psychotherapy Conference has become an event not to be missed. Last held in the United States in Anaheim, Calif., in December 1990, professionals from around the globe gathered to hear and meet the designers of modern psychotherapy. 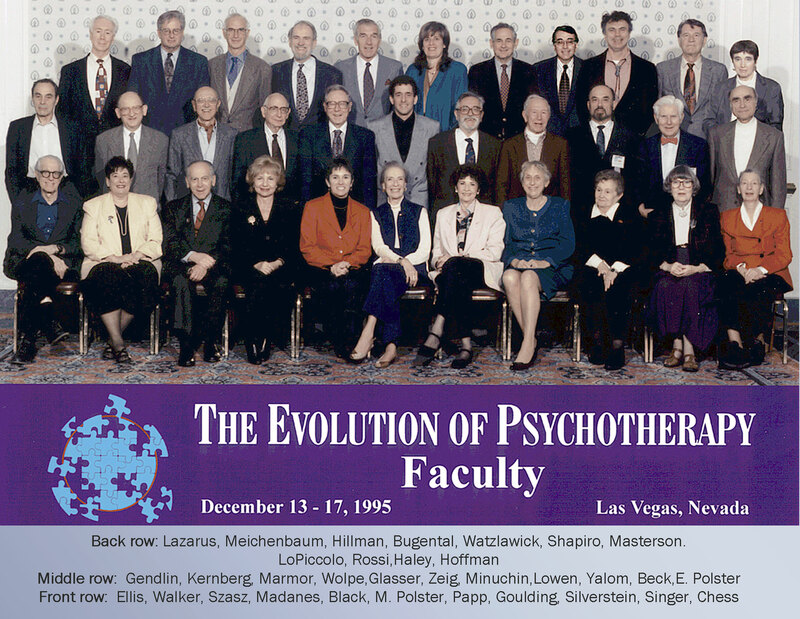 This faculty, along with new additions and State of the Art presenters, have assembled in Las Vegas, Nevada, U.S.A., for the fourth Evolution of Psychotherapy Conference, promising again to offer the strength and value of their historic contributions. James F. T. Bugental, Ph.D.
Judith Beck, Ph.D., with Aaron Beck, M.D. David J. W. Young, Ph.D., and Molly Sterling, Ph.D., with James F. T. Bugental, Ph.D.
Janet Wolfe, Ph.D., with Albert Ellis, Ph.D.
Carleen Glasser with William Glasser, M.D. Clifford Lazarus, Ph.D., with Arnold A. Lazarus, Ph.D.
Heiner Steckel, D.pi.Pa'd., with Alexander Lowen, M.D. Betty Alice Erickson, M.S., L.P.C. Attendees can select from a number of training events including Invited Addresses, Workshops, Clinical Presentations, Panels, Dialogues, Conversation Hours, a Keynote Address and a special ''State of the Art Track,'' featuring faculty new to the Evolution of Psychotherapy Conference. Invited Addresses will be offered in four time periods over the 4 1/2 day conference. After each address there will be 30 minutes for discussion of the address by another faculty member, and questions and comments from the audience. There will be two addresses per three-hour panel, and three simultaneous panels running in each time period. Concurrently with Invited Addresses will be three-hour Workshops for those who prefer a more extensive learning experience with an individual faculty member. Where the Invited Addresses are meant to be theoretical, the Workshops are designed to be more clinically oriented. Workshops also will be held in time slots with no other types of events occurring. Each Workshop period will feature up to eight concurrent sessions, and each period will feature a ''State of the Art'' faculty member conducting a session highlighting his/her therapeutic style and discipline. On Friday and Saturday morning, Interactive Events, including Topical Panels, Supervision Panels, Dialogues, Clinical Presentations, Conversation Hours will be featured. The panel discussions will take two forms: (1) Topical Panels (e.g., on resistance, sexuality, etc.) and (2) Supervision Panels, in which a registrant presents a case and panelists provide supervision. Dialogues will give faculty an opportunity to discuss topics in a "debate" format. Clinical Presentations can take one of two forms: Faculty will present either a film or videotape of psychotherapy or supervision, or conduct a live demonstration of psychotherapy or supervision. Conversation Hours feature faculty members who informally visit with attendees about topics of mutual interest. The State of the Art Track is a new feature of the Evolution Conference. The nine presenters bring to the meeting new and different viewpoints and ideas. There will be six State of the Art Workshops and three Special Addresses held during the course of the conference. A Keynote Address, featuring Gloria Steinem, will be held Sunday, followed by Closing Remarks.